Dominique Renaud might not be the most famous name, at least for a large audience. However, passionate insiders have known him for decades, as being the co-founder of Renaud & Papi (now owned by Audemars Piguet and known as APRP). 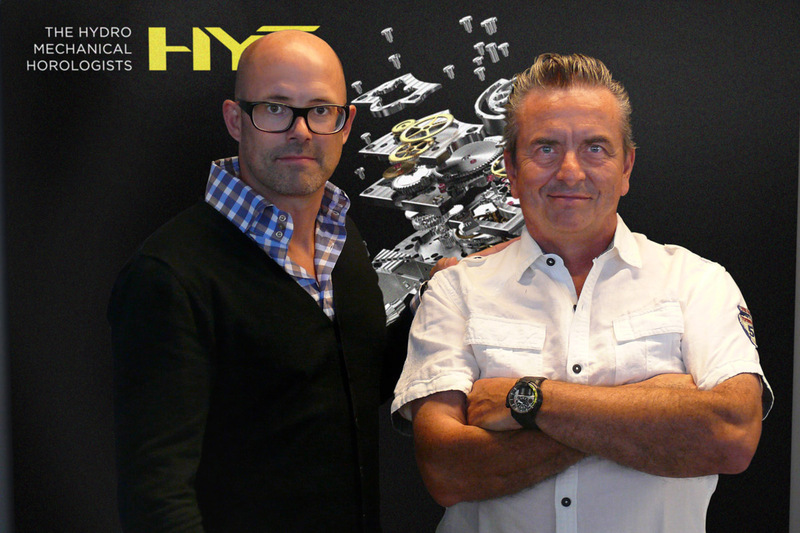 After almost 15 years of retirement, Dominique Renaud came back last year in the light; announcing he was to be part of HYT, as technical consultant. 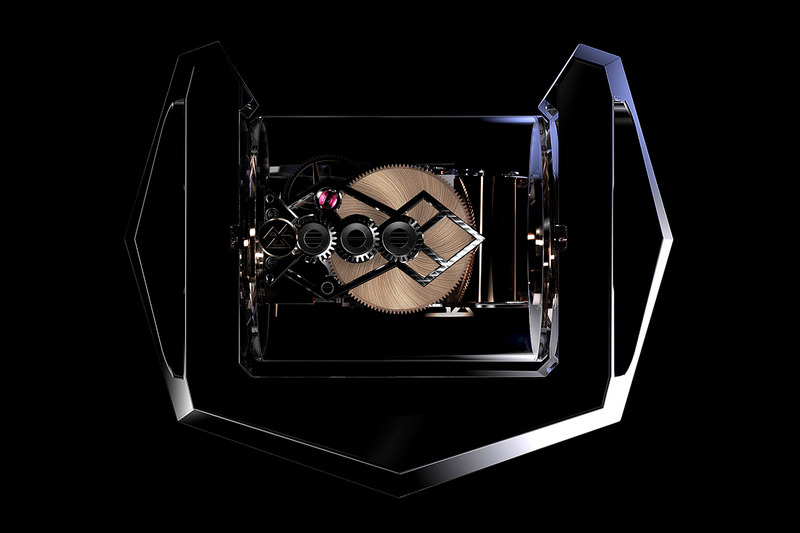 And now, he’s back, on its own, with a revolutionary concept watch, mixing highly innovative escapement type, energy efficiency and optimal accuracy. 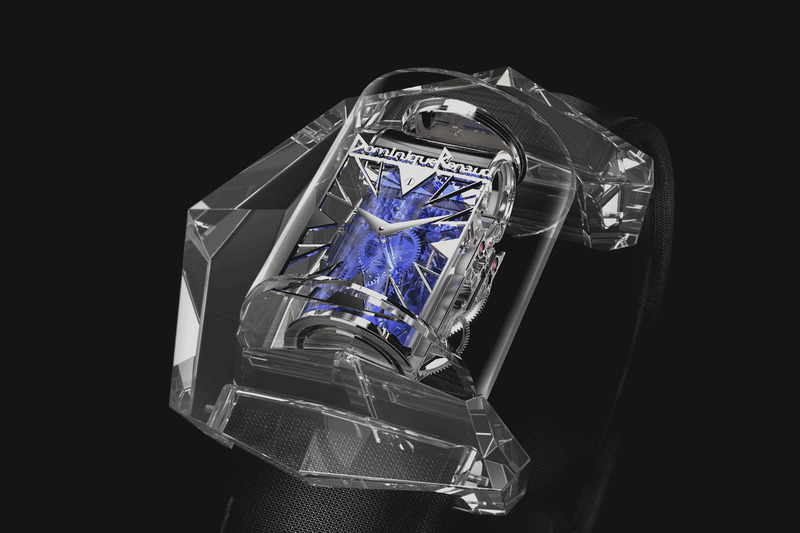 The watch is called the Dominique Renaud DR01 Twelve First and here what we already know about it. 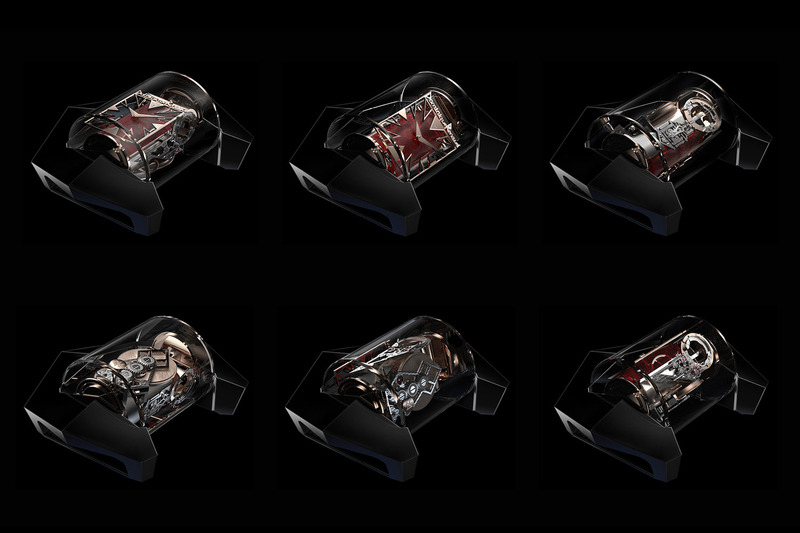 First of all, let’s put the debate about design (shape of the case and overall look of the Dominique Renaud DR01) aside, for a simple reason: the 12 first watches that will be manufactured are entirely customizable, meaning that probably none will look the same. 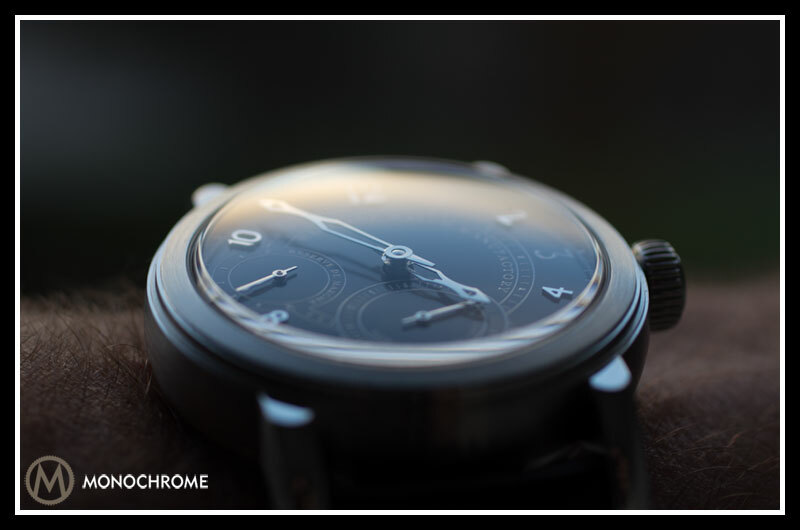 This watch is a concept, a technical experimentation rather than being a watch meant to tell time in a usual and classical way. The interesting part is not in the case or the dial. 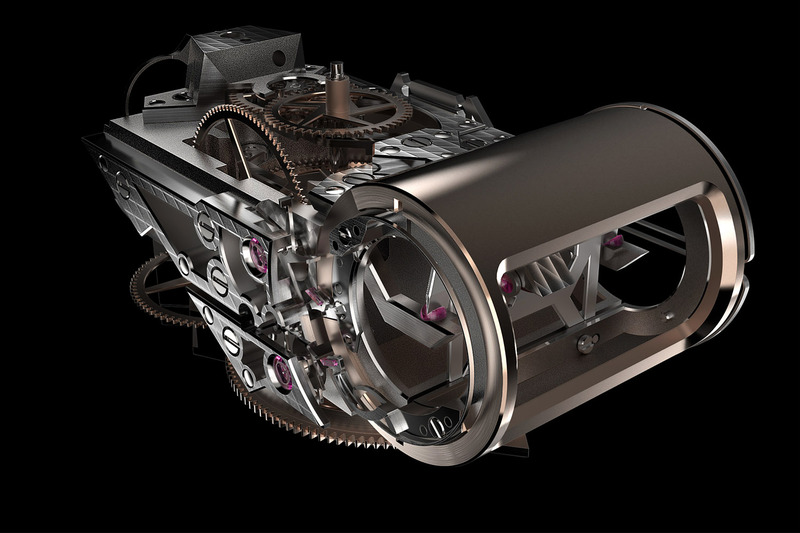 Everything that has to be considered is in the movement, an engine yet traditional in the way it is manufactured and finished but also completely innovative in the choice of technical solutions. Every aspect of this disruptive timepiece has been reimagined and redesigned: the regulator, the escapement, the amplitude and the frequency. For the moment, Dominique Renaud remains rather silent on the specifications and the methods used. We’ll do our best to show you what is known. 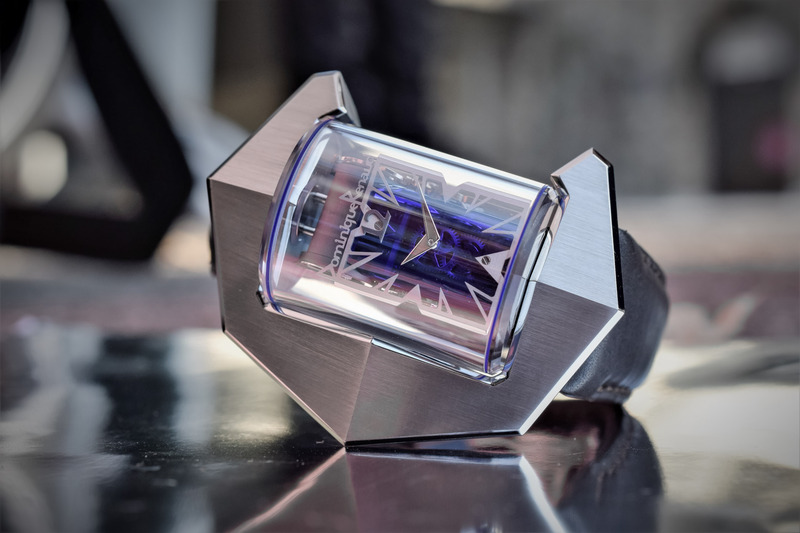 The case secures a cylindrical sapphire capsule and features an arch-shaped frame, evocative of a futuristic monolith. 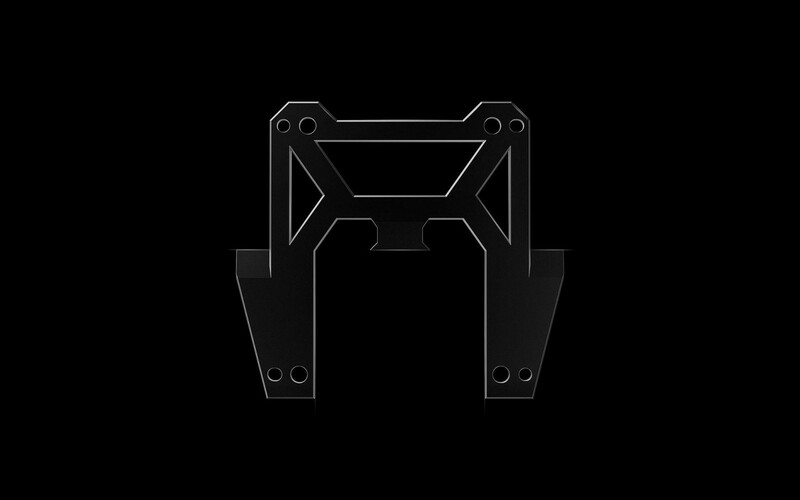 This arch is made in a solid block of material, to the choice of the future owner – from the first computer renders, we can imagine solid sapphire crystal, titanium, gold or… almost everything that can machined. 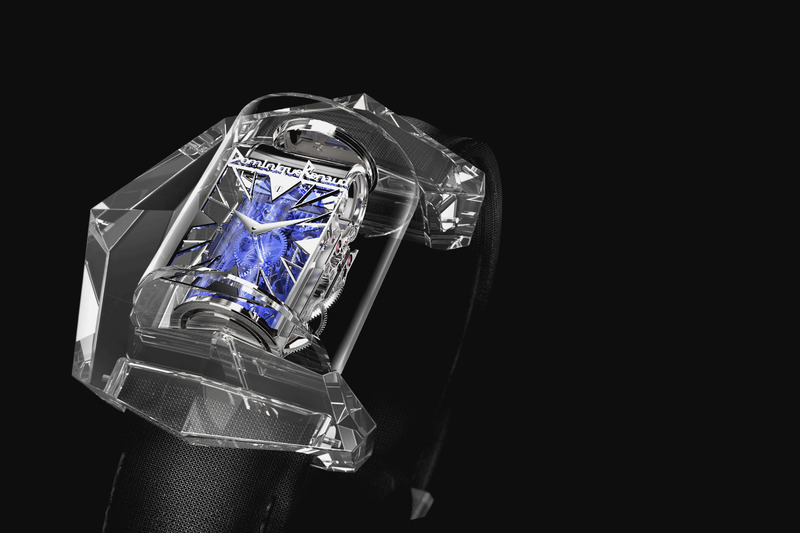 The fully transparent capsule can be rotated to display the movement within from six preset positions, a feature imagined just for contemplation purposes. Talking about contemplation of the movement, you’ll clearly have a lot to see. 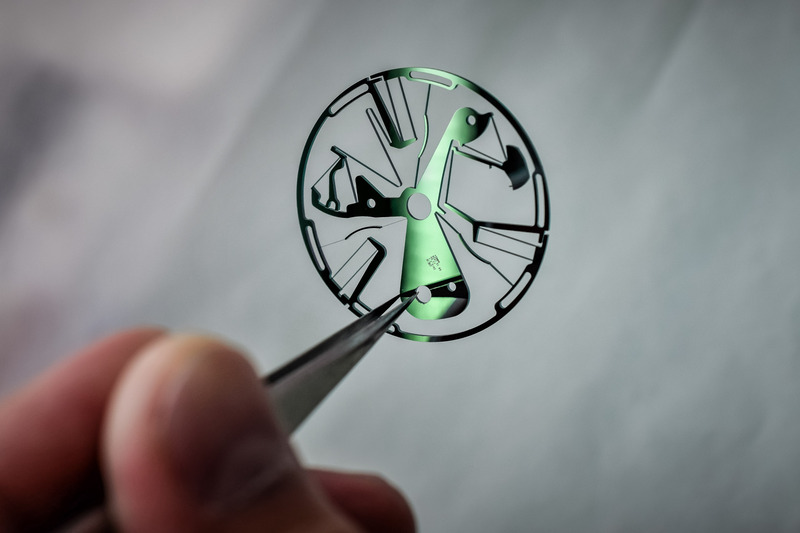 In fact, this movement is featuring (from the fragments of data we have yet) a brand new type of regulating organ, which isn’t classically build around a balance wheel and a hairspring. At the heart of the movement of the Dominique Renaud DR01 Twelve First is a new type of oscillator, a blade resonator (which can be seen in details in the photos below). This blade will in fact not oscillate like a balance wheel but rather vibrate to a very low amplitude but to a very high frequency… which, in theory, will bring two positive consequences. 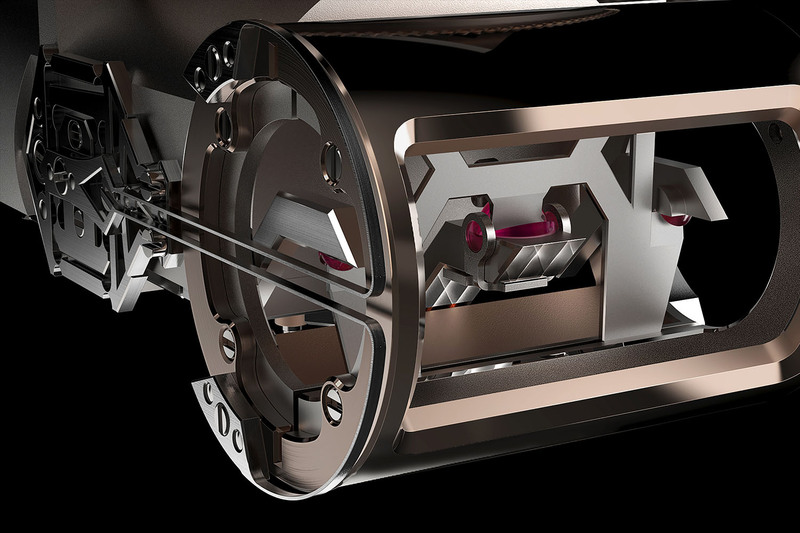 As the amplitude is extremely low, it requires less energy to actuate the regulator, increasing the power reserve. Then, frictions are minimal and so the consumption of energy will even decrease. Finally, a much high frequency (and a proper adjustment, but that’s another debate) virtually means a higher precision. Again, we have no idea of what the power reserve could be (even if the watch is said to have an unprecedented energy efficiency) or what the frequency of this oscillator, as well as its amplitude could be. The solution used remains also quite unexplained and from what can bee seen on the photos, we can notice that the escapement relies on blades (so certainly using the concept of flexibility) but still have a (sort of) classical escape wheel. On the other side of the watch, we can notice a large spring (named crossbow spring) that certainly replaces the traditional hairspring as a regulator of the amplitude and frequency. 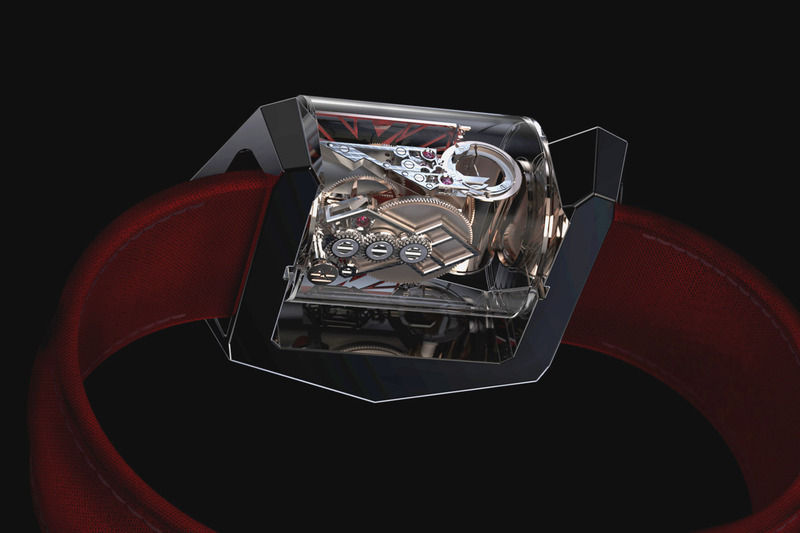 In some ways, this concept is reminiscent of recent developments made by Vaucher and Parmigiani Fleurier in the Senfine watch, using a Genequand escapement. 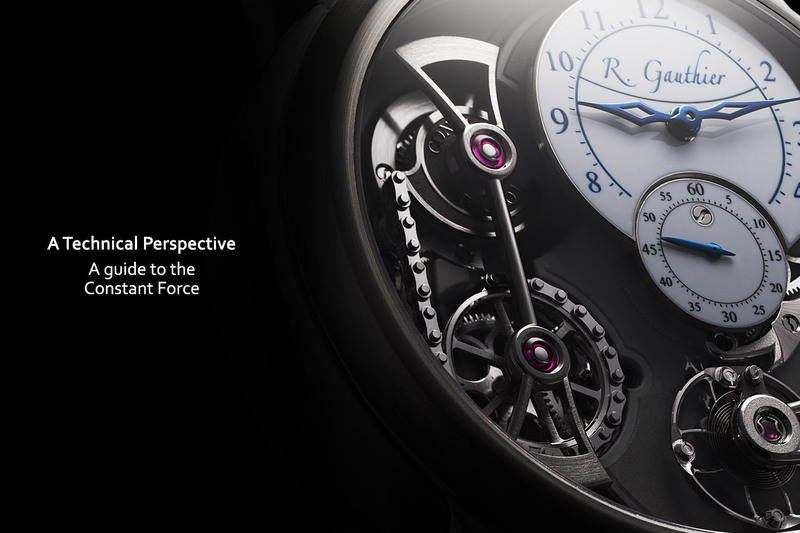 Both watches use blades, flexibility, low amplitudes, high frequency, resulting (in theory again) in ultra-long power reserve and improved accuracy. However, the concept used in the Dominique Renaud DR01 Twelve First might look for the same goal but the technical solutions used are rather different. 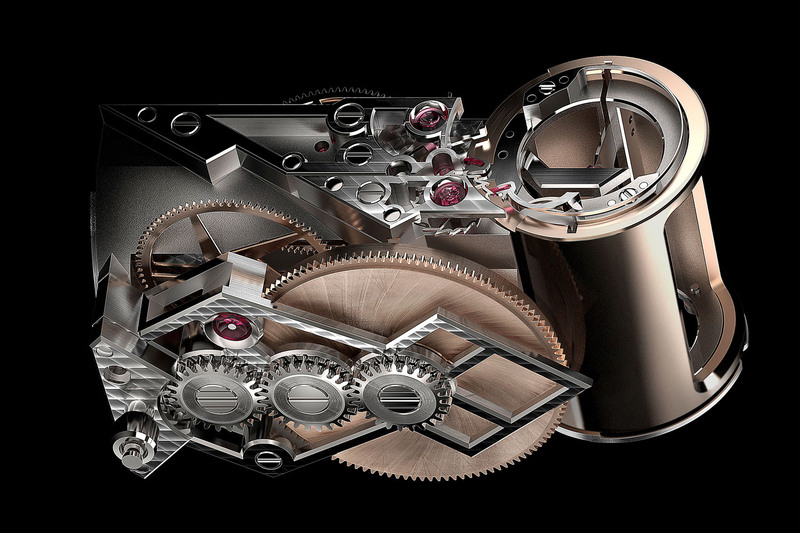 The rest of the movement used in the Dominique Renaud DR01 Twelve First, its 3D and highly sculptural shape apart, remains rather traditional, with use of a large barrel to store energy, with a classical gear train and traditional haute horlogerie finishes. No indication yet about the availability or the price (even if some rumors running around the watch-journalists microcosm say 1,000,000 Swiss Francs… But this is still a rumor). More specifications will come soon and will come back to you about this Dominique Renaud DR01 Twelve First after a meeting with master watchmaker Renaud, for more explanations. high frequency and low amplitude: what each concept represents ? how is it combined ?